Meat Tray: This is also known as a hopper, and this is where you will hold strips of meat or cubes before adding it into the feeding tube for grinding. Feeding Tube: This is the place where the meat will grind. How bigger the diameter of a feeding tube will depend upon the size of the meat grinder. Plunger: It will push the meat into the feeding tube so that the auger can grab it. Auger: It is a spirally shaped accessory, which is going to grab the meat and pushes it into the cutting blade. Cutting Blade: It cuts the meat into extremely fine pieces. Grinder Plates: The size of the ground meat is going to be determined by these plates only. You need to place the pieces on the tray. As said above, the larger the tray is, the more meat you can grind at a time. Once this is done, you turn the Screw while using the Pusher to push the meat inside. The screw activates the blades which cut pieces equally. The output is given from the end of the Hopper. Now here are some things which you need to know. Animal tissues and sinews can spell disaster for your meat grinder as. Fat and tissue may stick to the blades bring it to a standstill or may affect the circuits in case of the most advanced models. 1) Always use chilled meats: You don’t want to introduce warm meat pieces to the grinder. When the meat is warm, it tends to smear to the sides and make a mess within the grinder. Secondly, warm meat has fat which leaks out during grinding. What you get in the end is a dry and pulpy mess. Totally eww! The best way to do this is to put your meat in the freezer at least one hour before. For best results, let it freeze overnight. 2) Trim meats before loading on grinder: Have you ever wondered why smearing of meat is problematic to the grinder’s mechanism? This is because it sticks to the blade, making it dull. You need to trim it well rather than mindless chopping it. 3) Grind multiple times and clean blades to remove smears: If you ask which is the most important part of the grinder mechanism, then the answer is the blade itself. If it is sharp, it will cut and grind through anything. If the blade is dull, which happens when meat smears on it, it cannot work as effectively. Get your blade sharpened at least once a year. Alternatively, you can also buy a set of replacement blades instead, which come at economic rates. 4) Grind multiple times: When it comes to grinding well, there is a special technique. Try grinding from large to small pieces. Why? This comes especially handy when you want to prepare extra fine grind for sausages, for which you need to grind twice before chilling them. This effectively prevents smearing, gives a better ground meat and sausages with better texture. 5) Clean the plate regularly: The only reason you may want the meat to dry up and stick to the blades is if you want to get sick to your stomach, literally. To avoid this, it is suggested that you wash all parts of the meat grinder and remove leftover meats before using. Why Buy A Meat Grinder? 1) A meat grinder is safer: Nutrition specialists don’t recommend pre-packaged meats. This is because such products contain meat not from one animal, but from thousands of animals. Another problem is that the quality of meats may not be good. However, when you buy chunks of meat from your local shop and use the meat grinder, you can choose what goes into your meal. 2) Better control and flavor: Using a meat grinder enables you to control what goes into your mouth. When you buy pre-packaged meat from the supermarket, you have to take what is already packaged. 3) Keeping a better texture: Pre-packaged meats get oxidized and compressed slowly with limited moisture levels, while fresh ground meats are looser and better moisture levels. 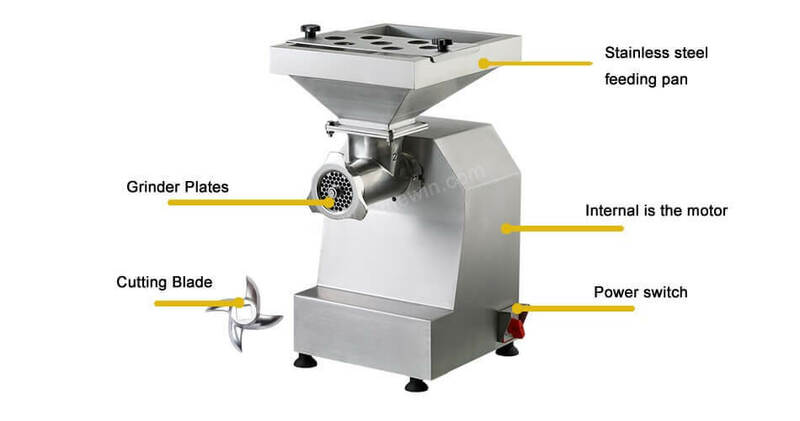 4) Its easy and cool: With a meat grinder at home, not only can you start enjoying your meals faster, but you will also earn kudos from your peers, friends, and family.